This essay took me a long time to end; mainly because, in many ways, I am still writing it. My first essay for HeroPress was two years ago (“W-W-Waiting For The Right Circumstances“), June 2015; an essay written at a time in which I was at my Zenith. It was a story written by a young man full of hope, dreams, and accomplishment. A young man peaking in his career and his relationships. A young man who still had a long way to learn in this world; especially about himself and what true community meant. This essay, the one you are reading now, is from rock bottom. People, mostly those who do not have depression, think of depression as a severe sadness; it is not sadness. Sadness can be felt. Depression is more of a vacuous endurance of life; each moment folding aimlessly into the next. Sadness would be a relief in comparison. I have had depression many times in my life prior to the one I am about to tell you about; previously I had managed to endure through it, this time was different and this time I needed help. I, unsurprisingly to me, was diagnosed with (aptly named) ‘manic depression’. This explained my amazing highs, my deepest lows, and the plateau of the in-between. What did this mean for me? I didn’t know, I was still me. Nothing about me had changed other than learning a new label that I had to bare. I was still me. I was still me. I was one in that four people; a large number, yet I felt alone. Alone because there is so much stigma attached to having a Mental Wellness issue that we barely talk about it, its almost taboo. We are a society more comfortable with having a broken leg than to tell our bosses, colleagues, friends or peers that we are depressed. After that talk, many people came out of their own closets to me and thanked me for being so ‘brave’ as to talk so openly about a subject so few understood much about. My hope with that talk, with this essay, that an act of openness like this is no longer seen as ‘being brave’ but being normal, being understood. It was the ‘bravery’ of people like Cory Miller and Rich Robinkoff that allowed me to be brave in telling my own story. That was September 2016. In February 2017, I reached my darkest hour when I attempted to take my own life. In many ways, this is my WordPress re-origin story. After surviving my own actions, it was the WordPress community that were there to support me. It was my friends I had made in the local WordPress community, and when I opened up about my experience, the international WordPress Community came to help me. There are so many people in the WordPress Community who I owe a huge debt to. People who genuinely reached out and cared about the response I gave when asked, ‘How are you?’. It was in this moment of realizing I had the WordPress Community that I began to live again; the WordPress community saved my life. It was in this moment that I realized that if I knew I could have this support sooner, I may not have gone as far as I had gone. It was in this moment that I vowed to be blatantly honest with the world so that no one else may ever feel that they are that alone again. Is there any other software specific community that can make the claim of being so caring as to have helped someone stay alive? I do not know the answer to that question, but I do know that WordPress and its community has definitely done that for me. I openly wrote about my experiences. I even mention it straight up in Job Interviews, and I do believe that this, knowingly or unknowingly, has costed me various positions I could have easily received had there not been any mention of a mental illness and my recent events – and its understandable. How would you react when you ask a candidate about why he left his previous employment, and he answers: “I am manic depressive, I went a few months off my meds, I did not understand it enough at the time, and then tried to take my own life and later moved cities to be closer to family and friends”? When all I could have said was I moved cities to be closer to family, with a smile that couldn’t be argued with. I started an initiative called WPHugs, a passion project hugely inspired by HeroPress, which is designed to be a safe space in the WordPress Community where topics of Mental Health, and general well-being and life balance can be freely and non-judgmentally spoken about, with care and compassion offered by all. This reminds me, we should have a creed, all great communities have one. 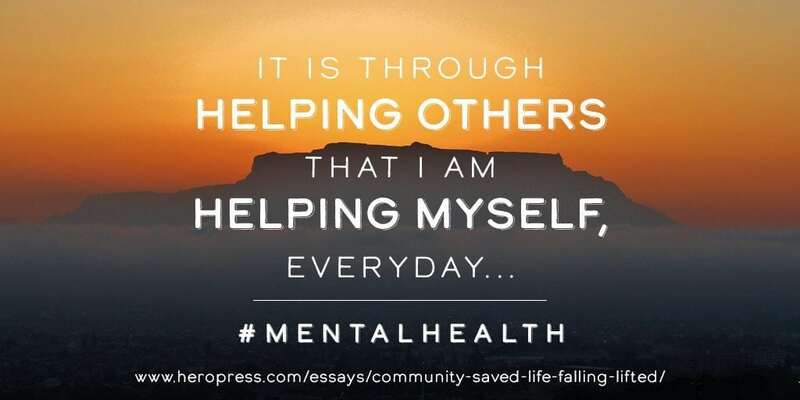 It is simply fortunate timing that WPHugs.org and this essay are launched and written in Mental Health Awareness Month. Some may even go as far as calling it serendipity; a word I have tattooed in Braille on my wrists. My story is not unique – it is simply one that is told. In speaking out about Mental Wellness and the huge role our community plays in its stigma, I hope that someone, somewhere, also gets ‘brave enough’ to speak up and reach out. I have no conclusion to this essay… I continue, everyday, to write it; and I hope you do too. The WordPress community doesn’t just power a percentage of the internet; It empowers too. P.S. Talking about it will only become easier by talking about it, so please, continue the conversation; lets more of us talk and keep talking. The post Community saved my life: Falling down, lifted up. appeared first on HeroPress.